Besides YA books, I’d say my most read category would have to be Adult Historical Fiction- dual timeline novels specifically. So, these are the books I’d recommend most for an adult book club! I’m only including books I’ve read and that I think lend themselves to discussion. Kate Morton is my FAVORITE author and you really can’t go wrong with any of her four books! But The Secret Keeper is a great place to start; Laurel witnesses a shocking crime on her 16th birthday involving her mother that haunts her through adulthood. The past story focuses on her mother Dorothy in WWII era England and it’s a doozy. Twists, tragedy, consequences, family secrets. All ripe for gasps and discussion! Set in Australia, this is the story of a young woman whose dreams are shattered; she inherits a sheep farm from her late grandmother and ends up delving into her grandmother’s past. It’s another juicy, thought-provoking, romantic, and tragic dual timeline novel with issues of race, money, and love. Lots to puzzle over. I didn’t love this book but I was fascinated by it. It is told in 5 parts, by 5 different characters, which I enjoyed. The writing was beautiful and descriptive in a way that made you feel what everyone were experiencing, which wasn’t always pleasant. The characters were layered with many secrets, but the book filled me with anxiety and dread! It’s great for discussion and debate though, especially the ending. Just a straight up fantastic historical debut! Set in 11th century England, Emma of Normandy is a queen that is not terribly well-known but should be. The book is described as “A rich tale of power and forbidden love revolving around a young medieval queen” and it lives up to every word. Emma is strong and interesting and I really enjoyed learning about this period of English history. It’s volatile and treacherous, and very exciting. The secondary characters and setting shine as well. It should be obvious by now that I am drawn to any story “for fans of Kate Morton”. This is a book that I still think about; it made me sad and felt melancholy but I liked the characters and didn’t find the mystery obvious at all. I preferred the storyline with Erica and Beth’s great-grandmother but the present day storyline had its intrigues too. It will make you think about the power of your choices, family, and what you would do for love. I read a lot of books like Morning Glory- present day heroine with some guilty or tragic backstory who stumbles upon a parallel woman’s story from years past. It’s a great formula and I’m always sucked in. I’d definitely recommend this book if you HAVEN’T read as many of them as I have. It felt formulaic to me but I enjoyed the unique Seattle houseboat setting and again, lots of great topics for discussion- infidelity, grief, second families, etc. I imagine a lot of people have read this, especially recently, but this would be a really FUN book club choice! Especially if you could watch episode 1 of the tv series afterwards :) I adore the historical setting and Claire Fraser’s place in it. And just think of the questions you could ask: Frank or Jamie? Is Claire an adulterer? Could you survive as a modern woman in a time where women did not have roles or power? Plus there are all those steamy scenes to dissect too ;) I loooove this series. This would make the most excellent miniseries or tv show; it is the story of Thea, a Jewish slave in 1st century Rome and it’s fantastic! 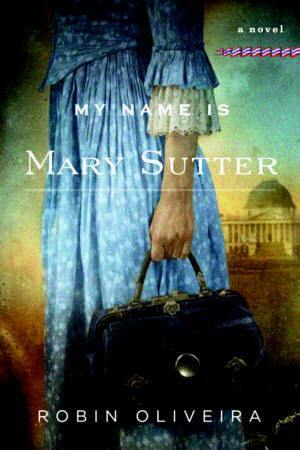 Very readable even if you don’t read a lot of historical fiction. The opening scene captivated me immediately and the characters pulled me in faster than I would have thought possible. They were complex and interesting, and loving and vicious- they were real people. I also adored the setting- it was rich and vivid in detail yet pleasing to read. It’s also extremely cinematic! I could picture it all so easily. Would be fun to “cast” the movie and discuss life in ancient Rome. I also love contemporary romance, books I like to describe as romantic comedies: if they were a movie, I’d watch them all the time! 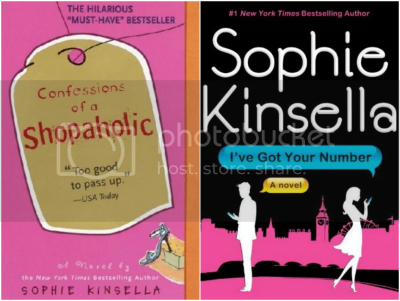 So these two choices from Sophie Kinsella, one of my favorite authors, would be fun too! Ironically this movie isn’t very good but the book is! Becky Bloomwood is like a modern-day British I Love Lucy. The capers and hijinks she gets herself into because of her shopping addiction are hilarious and oh-so-embarrassing. She’s charming, easy to relate to, and a lot of fun. Plus her love interest is dreamy and the secondary characters are great! A really fun choice and great series. This is my favorite standalone Kinsella book! Again, it’s cringeworthy but hilarious and has a goofy but fun premise: Poppy loses her engagement ring and cell phone but finds a lost phone in the trash. Well, the owner of said phone would like it back and they begin a madcap texting relationship until everything can be sorted out. She did a great job of evolving the characters and their relationships in a believable way as well… I adored Sam :) There is definitely more substance to Kinsella’s novels than you might think at first, even if they do end in satisfying ways. It’d be fun to discuss what YOU would do in Poppy’s situation! OOoh nice! These are all new to me reads! Outlander is a must read for sure!! But choose a month with 31 days for it, because despite being absolutely addicting, it is also quite long! Great list! All of these would make awesome book club picks! This list gave me lots of ideas! I’ve heard Outlander is really good. You know, I’ve read one Kate Morton book but I wasn’t really a fan. This book, however, sounds awesome. I think I read The Forgotten Garden. I just couldn’t do it. No idea why. I’ve heard of a lot of these but honestly haven’t read a single one (and yes…that means I haven’t read Outlander. I’m scared! It gets all this hype. What if I don’t like it??). I’m sure I’ll try to change that soon. Great list! I haven’t heard of Mistress of Rome but I am definitely going to be looking for that one. Outlander is on my TBR shelf but I haven’t read it yet. I’m going to have to check out Mistress of Rome. I hadn’t heard of it before but I love ancient Rome. O M G you made me literally fall in love with all of your picks! I absolutely love historical fiction but have a hard time finding books that catch my interest- I am adding most of these to my TBR pile right now! Great list. So I think you already know how absolutely in love with this post I am – it’s pretty much perfect from the first book to the last! So here goes: Secret Keeper yyyeeesssssssss (need new book now please?!? ), Wildflower Hill oh my goodness I could not have loved this book more, even though it broke my heart into a million pieces, Tigers in Red Weather the writing was amazing but wooooowwww that fifth viewpoint just freaked me out so much! !, Shadow on the Crown I just recently purchased this book and can’t wait to read it!! !, The Legacy exact same feelings as you!, Morning Glory I’m so glad you said that about it being formulaic (but still good) because that was my concern!, Outlander gggiiirrrrrllll you know all about my Outlander feels, and Mistress in Rome you’ve piqued my curiosity, will check that out soon! I don’t know why but the idea of book clubs just give me anxiety. Pretty sure that’s just me though. And dude, I wasn’t even aware of how DENSE Outlander was! Can you believe I have not YET picked up Outlander? !